Swivel Rocker Cushions - Made In The USA! Swivel Rocker Cushions are made thick and luxurious so that you can enjoy true comfort while you relax in your swivel rocking chair. 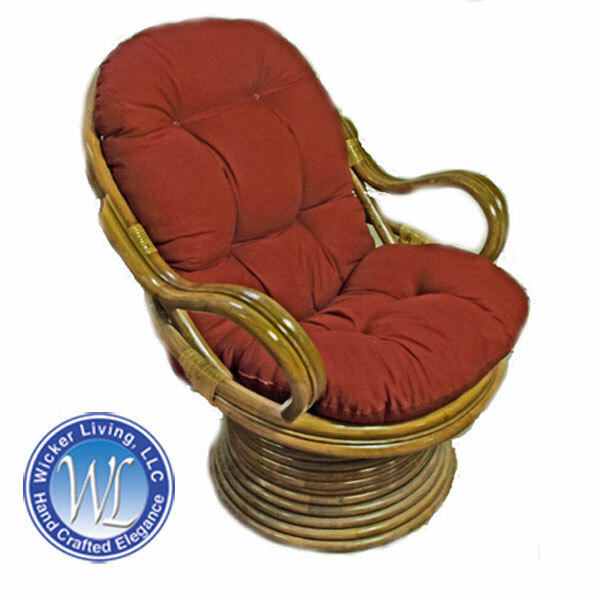 Our 24 x 48 inch swivel rocker papasan cushions are designed to be used with a rattan swivel rocker (also known as a papasan rocker) and other comparably sized swivel chairs. Our swivel chair cushions are hand made in the USA. Each rattan swivel rocker cushion is made complete with six sets of ties, three on each side to hold the cushion to the rattan frame. Two sets of ties are at the top, two at the fold and two at the bottom. Rattan swivel chair cushions measure about 5 to 6 inches thick. These tufted cushions are filled with soft spun polyester fiber that is hypoallergenic. The fiber fill is generously hand blow into the cover ensuring a balanced firmness through out the entire cushion. The tufts provide a unique appearance that can’t be overlooked when looking for that papasan style. The tufts also provide an important function that most people don’t know about. That is, the tufts provide stability for the fiber so it does to shift within the cover. The tufts keep the fiber from getting lumpy or flattening out. Select from indoor fabric, spun polyester all-weather fabric or Subrella® fabric for your new replacement cushion. When choosing fabric for your cushion, choose a color and pattern that suits your aesthetic as well as the conditional needs of your surroundings. Pick a color and pattern that works for you. Also, choose a fabric type that is right for the location. Indoor fabrics are strictly for indoor use. They have little or no ultra violet (UV) light protection and should only be used indoors. These fabrics should only be dry cleaned. All-weather spun polyester fabrics are print fabrics perfect for both indoor and outdoor use. Inks are printed on a spun polyester fabric to obtain the fabric color/design. Wisely used in four season and sunrooms, these fabrics have the same or similar soft texture as indoor fabrics but are extremely resistant to outdoor weather and hold good UV protection. 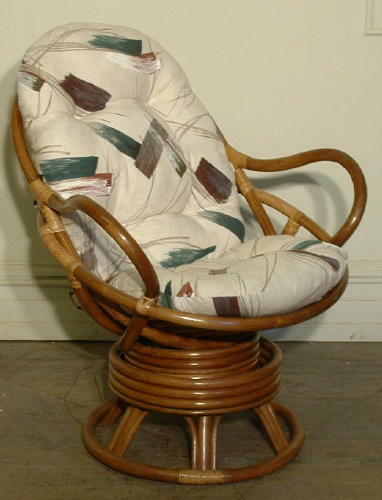 All-weather fabrics used for swivel rocker cushion hold up better than cushions manufactured from indoor fabric. These fabrics can be cleaned with mild detergents and rinsed off with a hose, and let to dry in a dry location. If your furniture is in a room that offers a lot of sun or is exposed to the sun for long periods of time on say a porch or patio, you should be considering Subrella fabric. Subrella fabric is an acrylic fabric with the color embedded in the fibers that offers the highest UV protection available. The UV inhibitors keep Subrella fabric from fading. Subrella fabric is extremely resistant to wear, mold, mildew and offers a 5 year guarantee against fading. This fabric is used extensively in the South and anywhere that four season rooms exist. This acrylic fabric wares better than most other fabrics, won’t stain easily and is easy to clean with a mild detergent and water. Some specific patterns, referred to as, one-way patterns, present a directional issue with the way the pattern is displayed when the cover is normally sewn together. The issue for these certain patterns is, that when you can see both sides of the cushion cover at the same time, one of the sides will appear upside down. There are very few of these types of fabric and we would notify you should you choose one for your project. An example of this type of fabric would be one with a patter of boats with all the masts aiming in the same direction. You can replace your existing swivel rocker cushion with one that better meets your needs and decor requirements. Is your swivel cushion worn, stained, ugly or just the wrong pattern or color? Choose colors, solids, patterns or stripes that offer a new and exciting accent to your room. Our thick comfortable swivel rocker cushion is durable and provides the support you expect when trying to relax. Wicker Living representatives are ready to answer any questions you may have regarding our cushions or fabric.